A few years back I was standing at a bus stop in London feeling like I was missing out on the Thanksgiving spirit. I was leaving work and knew around the same time my family was starting to get together to enjoy Thanksgiving. And then I had the most brilliant idea…my own dinner party! I scrambled for my phone and dialed my friend Paddy’s number. I asked him if he wanted to make a Thanksgiving dinner with me and invite a few common friends over. He then turned as excited as me and we chatted about the menu the rest of my bus ride home. That weekend we drove to 3 different grocery stores to find the right ingredients to make the traditional dinner. We had a fantastic Thanksgiving dinner in the end even though most of the food was served cold! So with only a few more days until Thanksgiving, it’s time for Pecan Pie! 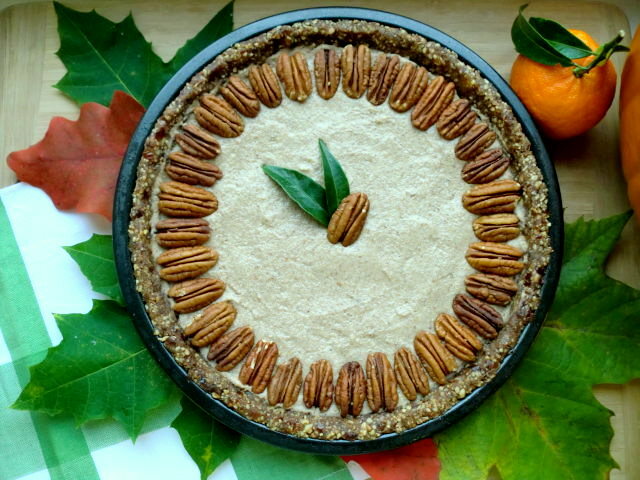 This year surprise your guests with this deliciously sweet raw version made with a Candied Pecan Crust and a creamy Citrus Pecan filling. Happy Thanksgiving everyone! Process the pecans until a course meal forms, then add the rest of the ingredients. Wipe a pie pan with coconut oil and press the pecan dough into the pan to form the crust. Blend all the ingredients until completely smooth. Empty into a bowl and fold in the flax. Pour into the prepared pie crust and smooth over. Decorate with additional pecans and the leaves from the clementines/ tangerines. This entry was posted on November 21, 2010 by Olive. It was filed under Raw Food . Perfect recipe. Love Pecan Pie and love not using a pound of butter even more! We should submit to Paula Deen and see if she can stomach – hey ya’ll! Yummm…pecan pie can be so sweet, but this looks delicious and not so much sugar….I want to try it! Your desserts are ridiculous! They all look amazing! Can’t wait to try out some recipes!!! Great blog! !